For the Best Titles of Press Releases Ever file, see this one, received today by a fellow MoJoer: “Scientific Reason for the Ashton and Demi Breakup according to a Cougar Dating Study Conducted by WhatsYourPrice.com.” And there’s a chart, which we’ve included below. WhatsYourPrice.com is pretty much what it sounds like: A dating site based on the idea that every man and woman has a potential market “value” in dollars, depending on their age and attractiveness and some other stuff. It’s even more soul-crushingly exploitive than it sounds, but more on the company in a moment. First, dig their “scientific” dishing on Demi Moore and Ashton Kutcher, celebrity lovers whose age difference has long enthralled Hollywood paparazzi, and whose coupling is now supposedly threatened by infidelity. Demi and Ash are part of a larger negative trend in “Cougar-Cub relationships,” writes company founder Brandon Wade, an MIT grad who also authored The Definitive Guide to Sugar Daddy and Mutually Beneficial Relationships. Cougars, of course, are what douchebags call attractive older women; cubs are the attractive young men who love them. Now that we’ve defined our terms, on to the pseudoscience: Let’s figure out what everyone is worth, in dollars, based on age and hotness! …we see that the perceived value of an attractive woman peaks when she reaches 25 years old, and gradually diminishes as she ages. The perceived value of an attractive man however, starts at a much lower price when he is young, peaking only when he reaches the age of 34. It appears from the value curve above that at least some stereotypes we often hear do hold some truth. For example, that female models earn the most before they turn 30. Or that men become more attractive as they age. Demi and Ashton started dating back in 2003 when she was 40 and he was 25. The green circle on the value graphs show the value at their respective age back then. Both were valued at approximately $70. This likely means both valued each other equally, which may provide a simplistic (but scientific) explanation for why the two started dating back then. 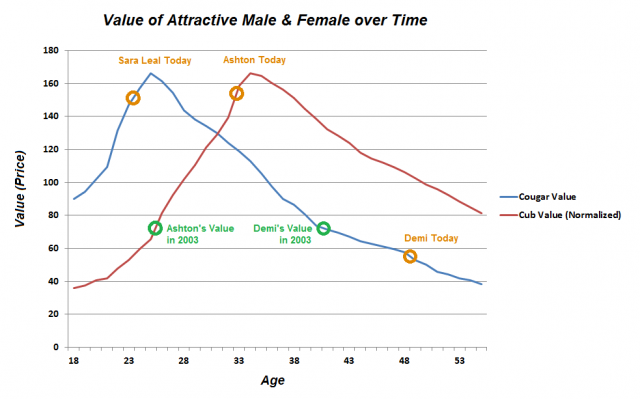 Over time, as both age, Ashton’s value has been on the rise while Demi’s have declined. Fast forward to 2011, the orange circles on the curves show Ashton’s value at approximately $158, and Demi’s value at $56, a $101 difference in Ashton’s favor. This may explain the recent rumors we read about Ashton cheating on Demi, and that their relationship may soon be over. It is also probably a coincidence that Ashton’s new mistress, Sara Leal, who is 23 years old has a value that is more closely aligned to his. So where is Wade getting all these dollar values for warm bodies anyway? Ah, that’s the WhatsYourPrice.com difference: The site’s raison d’etre is to get folks to set their bidding price for a hot date—to establish, through open trading, a stable market value for everyone who’s seeking companionship. “Most of us are already pretty familiar with the idea of buying a first date,” Wade’s site states, but “an economic model of pricing and paying for a first date did not exist in the real world…until now.” Basically, if you’re “young and attractive” by WhatsYourPrice.com standards, you can put yourself up for a first-date auction and make some dough. And if you’re a lonely guy with money to spend, you can buy yourself a first date with an insanely attractive woman. All the while, you’re providing Wade with macro data on his macabre sexual-slave market. It’s like some grand Nate Silver experiment, only, you know, completely douchey. While some of you may find this study to be offensive, please understand that it is not our intention to offend. The price value of an attractive male or female in this study is calculated from over 180,000 first date offers traded between members of our website. Our study is meant only to let us understand how humans, from a sociological and quantifiable point of view, evaluate each other. The very next line of the “study” begins: “The following is the Cougar value graph and the Cub value graph.” Don’t try to fight it, folks: It’s only science!